If you’ve ever had to train a new employee, and the guy was taking a long time to catch on to tasks you could do without a moment’s thought, you might have found yourself thinking the same things as I did the other afternoon. I was attempting to train a new worker how to use the leaf blower to herd dead leaves into one big pile. There is a profound difference between creating wind and using it to affect some purpose. His insensibility to this, and the resulting random rearrangement of leaves, led me to my first great trainer’s cliché. “It would be so much easier to just do this myself,” I thought. But that would mean sending my trainee away discouraged. I worked with him on the rudiments of directional leaf blowing. It was a hard sell, which inspired my next trainer’s lament. “This guy has the intellectual capacity of a five-year-old,” I said to myself. I spent 20 minutes walking sideways with him, shrinking the perimeter of ground covered by leaves. It was probably that I was uncomfortably hunched over the entire time, helping him aim the blower nozzle, that led me to my final nugget of trainer’s wisdom. “I’d be better off trying to teach a first-grader to do this,” I muttered. This is when I discovered that statements made to relieve frustration (and back pain) lose much of their impact when reality robs them of their comforting hyperbole. The new employee had the intellect of a five-year-old because he was exactly five years old. It wasn’t my idea to hire him for this work. He volunteered. In fact, he volunteered so vehemently that I’m sure he would have run into the house crying if I’d denied him his training. Little boys are fascinated by power tools. Combine the necessity of plugging it in to an electrical outlet with the magic of creating wind, and the leaf blower is a kid magnet. Unfortunately, the power of the gods comes with a steep learning curve for a kindergartener. To his credit, he stuck with the training, and the associated parental scowls, long enough to get the hang of it. When our herd of leaves was under control, I let him go solo. He even earned a short break for the obligatory leap into the pile. I just hope this doesn’t make him think that after his first day of training at McDonald’s they’ll let him jump into a pile of hamburgers. Makes you wonder how many children get bagged up and carted away with the leaves every year. In the end, he learned a little bit, and I learned a lot. I have to practice being more patient with my volunteer helpers. As to whether I would be better off trying to train a first grader, well, I guess we’ll find that out next year. This entry was posted in It's a Guy Thing and tagged children, Dads, family, fatherhood, humor, kids, parenting, Sons, Training, yard work. My boys run away from anything that makes even a moderate amount of noise, except for the motorcycle. They always enjoyed rides on the bike. I don’t think I have to worry about any volunteers offering to help me with leaves or grass anytime soon. The closest my son is going to come to a motorcycle at our house is the lawnmower, and it’s not the kind you sit on, so I think the leave blower is a good place for him to be right now. Ah, the joy of leaves! I remember those days. With us though, all we had to learn was how to use a rake. Your volunteer is already learning at the next level. Good for you for teaching him. The training program on a rake is much shorter, and I’m pretty sure results in less scolding, so old school does still have its advantages. That is true, it does require less training. However, scoldings can still occur in those instances when you threaten your siblings with the rake. I’m pretty sure that’s not part of the training. Okay, so maybe the new guy won’t be this month’s ‘Employee of the Month’ in your household…Still, if employees working at McDonald’s were as enthusiastic about their job as your son, I would order a Bic Mac each day just for the joy of it. Awesome post! You deserve a ‘World’s Best Boss’ mug! If I ever find a McDonald’s where the employees are so enthusiastic that they toss handfuls of burgers into the air and shout, “Confetti!” I’ll let you know. I’d like to go there too, but maybe not eat. Thanks, Sandy. But you didn’t hear all the yelling. Been there, done that! But they were older than five, physically at least. Most of us were in our 20s, as I recall. Haha I was all confused at first, like… What job that requires leaf-blowing hires someone who doesn’t already know how to do this? But now, I am jealous of your 5year old. Very jealous. Leaf blowers aren’t that expensive these days, and the leaves are free. There’s no need to wallow in jealousy. Kids have no idea that they have it made. No one ever volunteered to make piles of leaves at my house because it involved a rake that was self-explanatory in its function. Oh, to be a 5 year old in 2013 . . . But the modern world comes with lots of baggage to go with its leaf blowers. A rake might be less fun, but it could also be seen as a symbol of saner world. See what happened, just because you wouldn’t go help rake leaves? 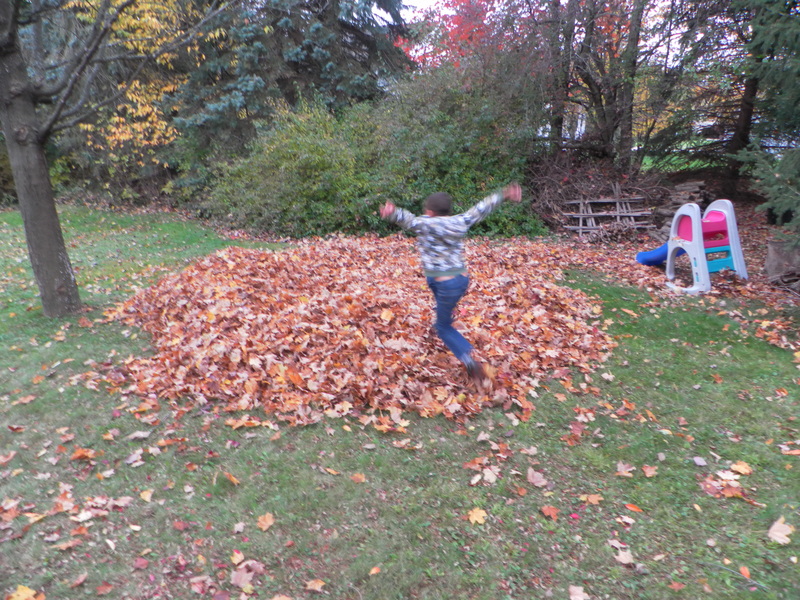 That is a HUGE pile of leaves!! I want to jump too!! 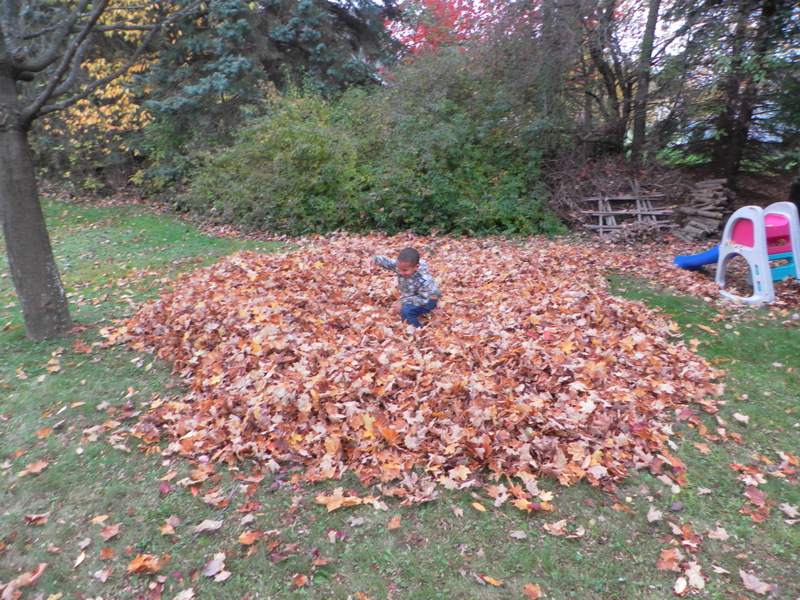 I collect a pile that size about four times each fall. If I waited to do it all at once, I would seriously be in danger of losing a child in that mess. Get rid of the trees. Problem solved. And with that I am sensing the tree huggers revolting. We have two fewer tress in the yard than when we moved in, and yet it seems like there are more leaves on the ground than ever. I think our one remaining maple tree is trying to compensate. Looking at that pile of leaves in your yard, I would say overcompensate.